E-Mail marketing always proves to be a challenge in that there are so many services, some free for certain levels, and some paid. 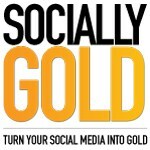 I initially started my SociallyGold e-mail list with MailChimp because it’s free for under 2,000 subscribers and sending less than 12,000 emails a month. You’ll have to pay if you decide to exceed those limits. I write this post because I have a lot of experience with email services in the last few years with Constant Contact, MailChimp and a new service that I found, AWeber. Of the three I have used, Aweber has been by far the easiest to use and they have great features, low prices and have social media integration. AWeber is an easy to use email marketing service that allows you to create e-mail campaigns. You can sign up for a $1 for the first month and the cheapest plan they have is $19/month for <500 subscribers, which allows you to send unlimited emails. The next tier is 501-2,500 subscribers which will cost you and extra $10 a month. The next tiers are as follows. You get a discount if you pay for a quarter at a time, You also get a discount if you pay for a year at a time. $19/month; $49/quarter or $194 for the year. Once you reach a different subscriber level, you’ll be charged which ever initial payment you’d like plus a fee for how many subscribers you have. Ex. If you have 5,500 subscribers and you are paying for a quarter (3 months) at a time. Your total every 3 months would be $49+$50=$$99. I have used AWeber for 2 months and have grown my subscriber list from 0-20 with their system. They have pre-made templates that allow you to add your own content. I found that MailChimp and Constant Contact were cumbersome to use. There was a large learning curve when it came to ease of use of the other two services. The templates are visually appealing, the platform is easy to use and they also provide customer support via phone or online chat. They even have a tool that helps you create a subscribe form that you can add to your website. I also enjoy that I can see who opens each email and who click on the links, which most email services already offer. The service will let me test when the best time of day to send an email is as well as test subjects with A/B testing to test open rates. Is it easy to make the switch from my old email client? preadsheet. I also have it setup that I get an alert when someone does subscribe. What is the AWeber support like? I had a question about the platform and you can engage in an online chat with one of their support specialists. They answered my question right away. They also host webinars, have an extensive Knowledge section and they even called me when I signed up to see if I had any questions. If you are still on the fence, you can sign up for a trial for $1.